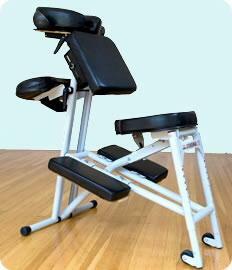 At first, 10-30 minutes may not seem like much - after all, how effective can a brief chair massage be? Studies have shown that the brain begins to recharge in just a few minutes. And with just the right touch, tired muscles feel rejuvenated right away. Now imagine how motivated your employees will feel when their brains and bodies are being refreshed in tandem, on a regular basis! Rested workers are relaxed and ready to get down to business. In addition, massage puts them in a refreshed, cheerful mood - the better to engage with customers and increase work performance. That's what "Select Massage"™ offers - a comprehensive On-Site Wellness solution for muscles and mind, workforce and management. "Select Massage's™ certified massage therapists can be scheduled for weekly, bi-weekly or monthly visits to your place of business - visits guaranteed to keep your employees productive, energetic and feeling good about themselves and their careers. A good massage is a great perk that leaves your employees feeling perky - it's guaranteed to pay for itself in productivity and positive energy. "Select Massage™" is both good practice and great PR.